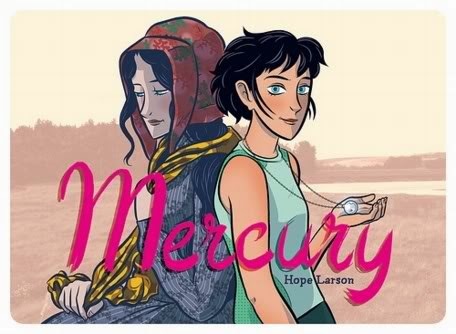 Today I will be telling you about a great book, Mercury, by Hope Larson. The plot of Mercury is extremely complicated. It's about a 15-year-old girl named Tara whose house burned down so she goes to live with her aunt, uncle and cousin. She meets a boy she likes and joins a cross-country running team. Something that kept me interested in the story is how every now and then, the setting will change to the house that burned down, but in 1859. When this happens, the main focus is on an ancestor of Tara's named Josephine who is also 15 at the time. Toward the middle of the book, Tara finds out that there is gold on her family's land that was left by Josephine. This book had a lot of really good gripping scenes. One of them is a scene where Tara finds the gold. She and her friends are digging for the treasure when they find a small tunnel filled with snakes. She goes down into the tunnel using her phone as a flashlight to find a skeleton with a bag of gold in its ribcage. I really like this scene because it turns the plain, small town story into an epic treasure hunting story. The drawing style in this book is very soft. It uses very thick wavy lines and I'm pretty sure that it was drawn with a paintbrush or a marker or something like that. The way the eyes are drawn is very pretty. They're big and shiny. I also like how Tara looks like a short-haired version of Josephine. It makes their bloodline connection seem even stronger. I think that Mercury is appropriate for all ages, but I also think that less mature audiences might not enjoy it because the storyline is a little complicated. 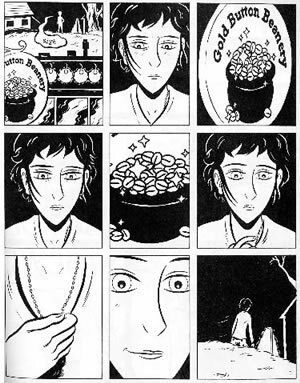 If you can take a complex story, you will love Mercury. I would give mercury 8 bags of gold out of 10. Eight bags of gold out of ten. Well played, sir. I love your reviews and how you find books that the NYT book review might bypass but that I am dying to read. "Mercury" sounds spectacular. Lots and lots of books still to read but I will add this one to my ever-growing pile. Great review.